Five Associate Fellows and one International Associate Fellow have begun a year of post-graduate training in the National Library of Medicine Associate Fellowship Program. The popular program prepares librarians for leadership roles in health sciences libraries and in health services research and is considered by many to be a “launch pad” in their careers. Julie Adamo received her MLS from the University of North Carolina, Chapel Hill in 2010. She was a research assistant for UNC’s GrantSource Library and a knowledge services assistant for Ipas, a non-profit women’s health research organization. She also interned in the Instruction and Outreach department at the Duke University Libraries and at UNC’s Health Sciences Library. Kristen Burgess received her MLS, with a specialization in health informatics, from the University of North Texas in 2010. She earned a BA in international studies from Emory University, during which time she studied in France and also interned at a primary school and health clinic in Uganda. Kristen Greenland received her MLIS from the University of Washington in 2010. Previously, she had been granted a PhD in Molecular & Cellular Biology from the University of Washington, in 2008, and, in 2001, a BA from Carleton College with a major in Biology. Stephen Kiyoi received his MLIS from the University of California, Los Angeles (UCLA), with a focus on medical informatics in 2010. He was a public service assistant at UCLA’s Louise M. Darling Biomedical Library, as well as a student assistant to Christine Borgman, Presidential Chair of the Information Studies department. Caitlin Sticco received her MLS in 2009, and a Specialist Certificate in Library and Information Studies in 2010, both from the University of Wisconsin at Madison. She received her BS in biomedical science from Antioch College, and has worked as a technician in molecular and cellular biology. Salima M’seffar, from Morocco, is an International Fellow. She received her BA with honors in June 2004 from L’Ecole des Sciences de l’Information, in Rabat, Morocco, and a certificate in Spanish in 2008. She joined the National Institute of Hygiene, also in Rabat, in November 2004, where she is in charge of the library. Since the National Institute of Hygiene started working on its transition to becoming the National Public Health Agency, Ms. M’seffar has supported its decision making through online searching and survey, and supporting ISO quality certification in laboratories. 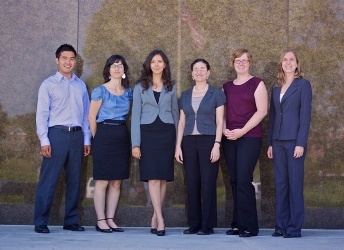 Photo Caption: Pictured, left to right, are the 2010-2011 NLM Associate Fellows: Stephen Kiyoi, Julie Adamo, Salima M’seffar, Caitlin Sticco, Kristen Greenland and Kristen Burgess.